While I'm still unsure on what wearables should actually do, I managed to get some photos of the Apple Watch. Unfortunately I wasn't really able to find any units available for a hands-on, and as far as I can tell it wasn't possible to actually try any of the software yet. However, based upon what I've seen Apple brings at least a few great ideas to the table. The digital dial/crown is definitely one of them, as it opens up the door to all kinds of new possibilities for navigation that are currently either impractical or impossible for wearables that don't have this hardware feature. In addition, Apple's strong emphasis on personalization with two sizes, three editions, and six watch bands is something that all OEMs should pay attention to. Finally, the dedicated SoC for the Apple Watch is something that is absolutely necessary to enable a good user experience as space is so critical on these wearables. There's also no question that Apple has done a great job of focusing on industrial and material design, as it looks like all three versions of the watch have premium materials and excellent fit and finish. While it isn't clear what display is used, it seems likely that it's an OLED display judging by the amount of black in some of the watchfaces, although ambient lighting in the demo area made it hard to tell whether this was the case. However, my reservations are largely similar to concerns that I have with all wearables. Ultimately, the Apple Watch must provide utility that's strong enough to make me turn around and get it if I forget it. As-is, I don't really think that even the Apple Watch has that level of utility, even if it is excellently executed. Of course, this is also based upon a demo unit that I wasn't able to touch or use. Of course, a few concerns remain, mostly in the area of battery life as it seems that only the Pebble line of wearables can really deliver enough battery life to not worry about charging a wearable on any sort of regular schedule. 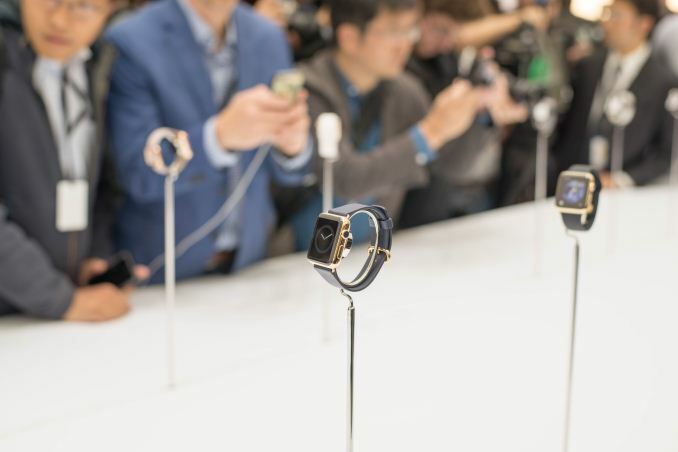 At any rate, I've attached a gallery of photos below for those interested in seeing all the various combinations of watches that Apple will make. "If the announced size is the height of the body ,excluding the hinges ,then the thickness including the back hump appears over 12mm and the screen on the 42mm one is most likely 1.5 inches and 5:4 AR." Anyway, besides the crown is not a good idea when you have touch and air gestures, if you mean having some controls on the side then maybe but not like that. Keep in mind that not everybody keeps their watch all that tight on the wrist so the less poking at it , especially on the side, the better - ofc for any device that looks like a watch, for smarter designs it's a bit different. Avoiding to go a a long rant but got to add that you can't make it thin or have good battery life you you layer scree, PCB< battery and finally back cover with sensors. You are better off not releasing anything than doing that but it seems that everybody is so eager to release half baked products at crazy prices. For anyone who ever has used a Blackberry, the crown works well if the UI is built around it. Yeah I'm not buying this crown part as an input method, almost seems like trying to revive the iPod click wheel... It went away for a reason. The point about the way people wear watches is something I hadn't even thought about, tho I'm not sure a touchscreen wouldn't be affected by that either, probably less so tho. The crown is very useful. But there are still touch and scrolling gestures. It does make a number of things easier. Apple showed pinch as a good purpose for the crown. Hard to pinch on such a small screen. Hard to tap sometimes as well. So the crown, with its turning and button, as well as the button below do add to the ease of use. I'm not hating the dial deal if it is done right. Touch and swipe is nice but on such a small screen I won't want cover it as much. It also has a pressure response. The problem are things that weren't mentioned like: is it water proof/resistant? Battery life? How does it do in extreme temperatures. I live in MN and my phone gets sluggish outside shoveling because of the negatives. I like the fitness aspects and would have appreciated a thermometer on either phone or watch. I don't have any huge issues of having to have an iPhone with it, but I am not fond of it likely using only Bluetooth because of the range. I'm guessing it only connects via BT. To me this is the best proposed first attempt at a smart watch to date. I'd like to see totally wireless charging. What Apple is doing is enough. It would have been dead to me if it had some sort of plug in.